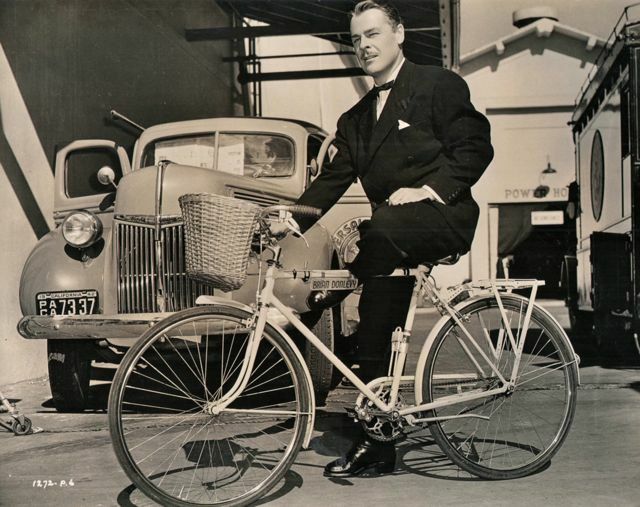 Brian Donlevy rides a bike, Universal Studios backlot, 1942. Here’s the snipe: There’s a reason for the evening attire and for the bicycle on which Brian Donlevy sits with such debonair abandon. The formal wear is for his starring part opposite Diana Barrymore in Universal’s ‘Nightmare,’ which is an affair about an American gambler and an English blueblood that boils down to the fact that: scratch a lady and you’ll find a woman. The bicycle is Donlevy’s solution to the rubber shortage.